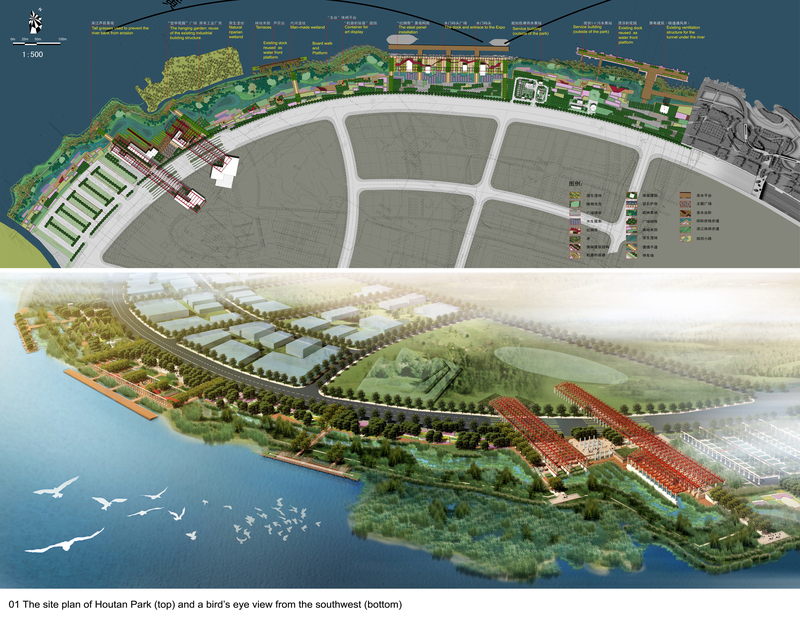 The site plan of Houtan Park (top) and a bird’s-eye view from the southwest (bottom). 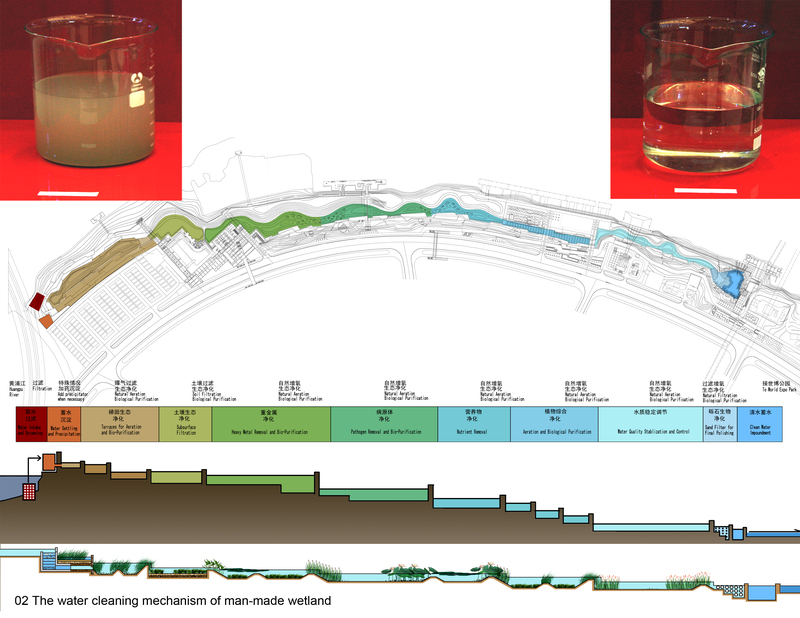 The water-cleaning mechanism of man-made wetlands. 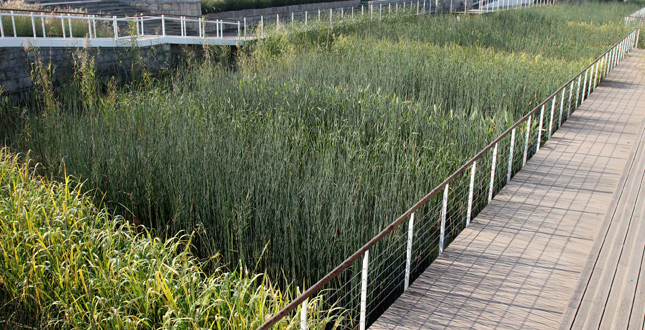 The linear wetland in the middle of the park with terraces covered by a variety of native grasses and wetland plants (view facing north). 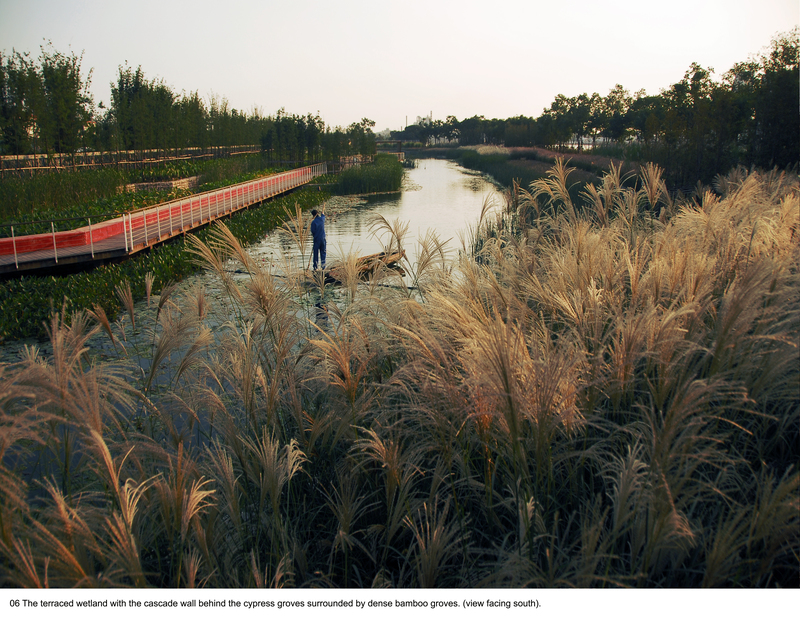 The terraced wetland is heavily planted to clean the contaminated water falling from the cascade wall behind the cypress groves, and the ecofriendly boardwalk composed of decomposable bamboo (view facing southwest end of the park). 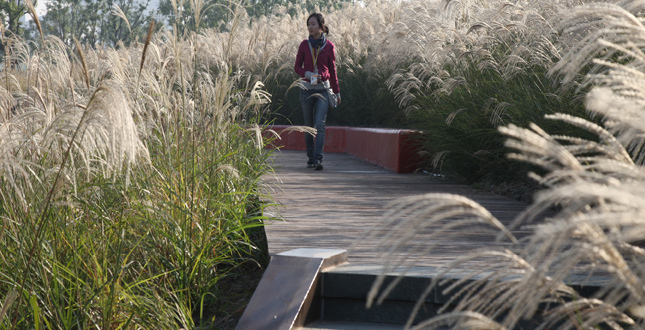 The terraced wetland creates a quiet valley, allowing people to access the water and enjoy the views (facing west with the Huangpu River and skyscrapers in the background). The terraced wetland with the cascade wall behind the cypress groves is surrounded by dense bamboo groves (view facing south). 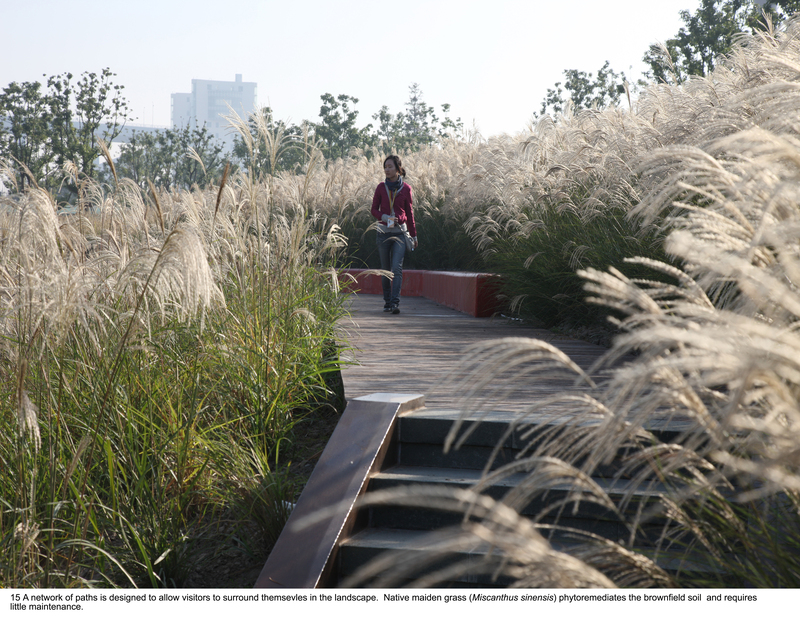 The terraced wetland is accessible for visitors to enter the inner spaces of the living landscape—dramatically increasing the capacity of the park during the Expo without sacrificing sensational experience. 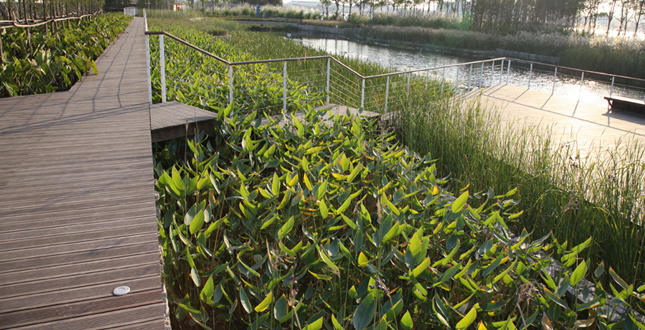 The banded pattern of the wetland plant community demonstrates the filtrating process of the wetland at the entrance of the park. 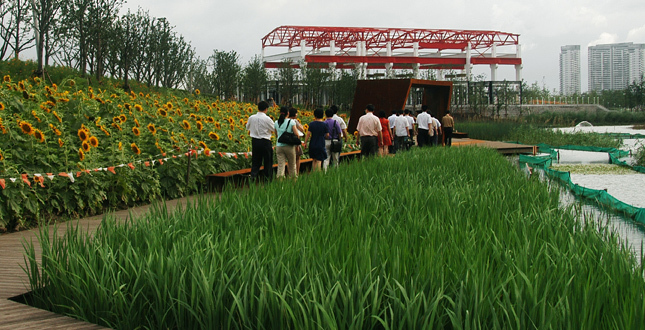 Crops (sunflowers and rice in summer) are grown in the terraces throughout the seasons to filter excess nutrients from the Huangpu River water and to make the landscape productive and educational. 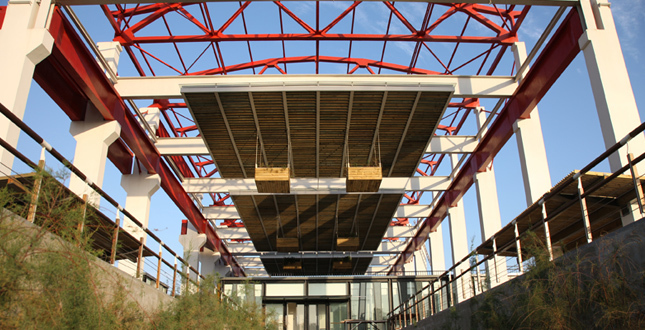 The hanging garden is designed around the existing industrial structure, with hanging planters installed above the teahouses located at a recreational center of the park. 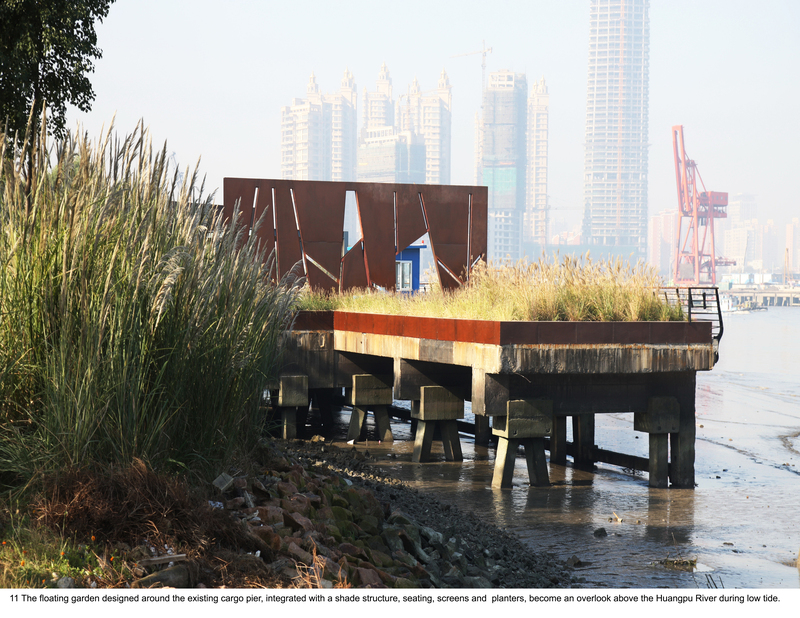 The floating garden designed around the existing cargo pier, integrated with a shade structure, seating, screens and planters, becomes an overlook above the Huangpu River during low tide. 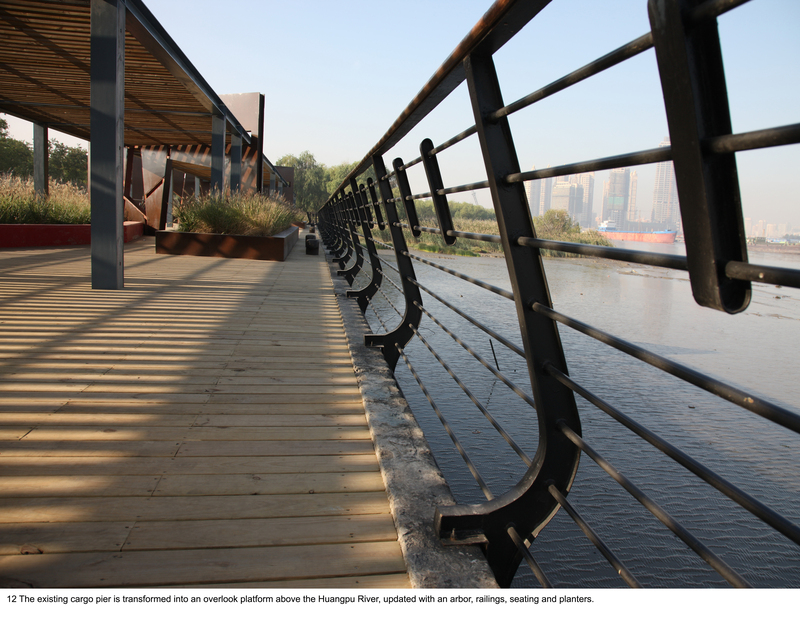 The existing cargo pier is transformed into an overlook platform above the Huangpu River, updated with an arbor, railings, seating and planters. 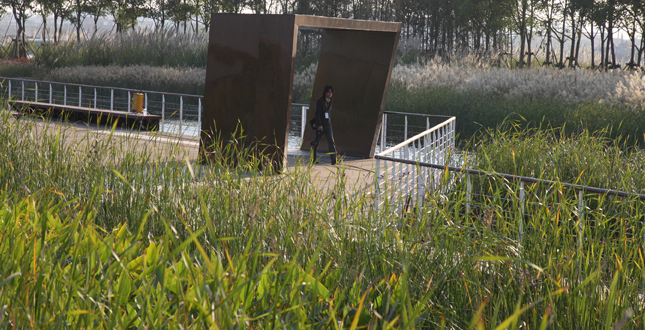 The steel arbor in the wetland is composed of recycled steel panels from the site, which provides shade, shelter, frames views, and shapes spaces. A network of paths is designed to allow visitors to surround themselves in the landscape. 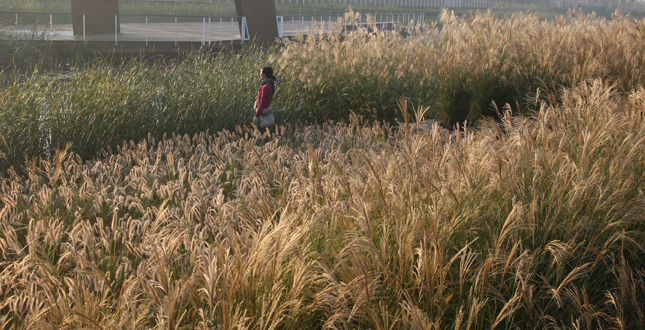 Native maiden grass (Miscanthus sinensis) phytoremediates the brownfield soil and requires little maintenance. 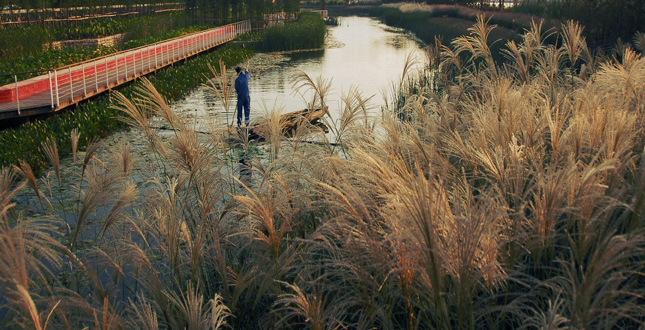 Built on a brownfield of a former industrial site, Houtan Park is a regenerative living landscape on Shanghai's Huangpu riverfront. 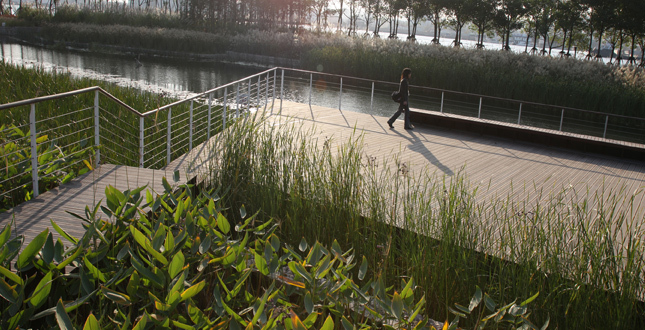 The park's constructed wetland, ecological flood control, reclaimed industrial structures and materials, and urban agriculture are integral components of an overall restorative design strategy to treat polluted river water and recover the degraded waterfront in an aesthetically pleasing way. Objectives: The objective of the park design was to create a green Expo, accommodate for a large influx of visitors during the exposition from May to October, demonstrate green technologies, transform a unique space to make the Expo an unforgettable event, and transition into a permanent public waterfront park after the Expo. Challenges: The first challenge was restoring the degraded environment. The site is a brownfield littered with industrial and construction debris both on the surface and buried throughout the site. The water of Huangpu River is highly polluted with a national water quality ranking of Lower Grade V, the lowest grade on a scale of I–V and is considered unsafe for swimming and recreation and devoid of aquatic life. The eminent site design challenge was to transform this degraded landscape into a safe and pleasant public space. The second challenge was to improve flood control. The existing concrete floodwall was designed to protect against a 1,000-year flood event with a top elevation of 6.7 meters (22 feet), but it is rigid and lifeless. The 2.1-meter (6-foot) daily tidal fluctuation creates a muddy and littered shoreline and is currently inaccessible to the public. 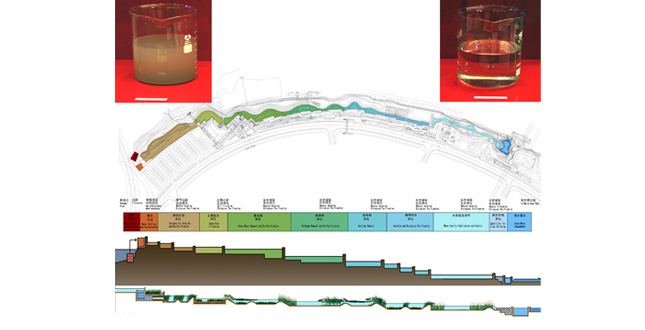 A conventional retaining wall would continue to limit accessibility and preclude habitat creation along the water's edge, so an alternative flood control design proposal was necessary. The third challenge was the site itself. The area is long and narrow locked between the Huangpu River and an urban expressway with water frontage is over 1.7 kilometers (one mile) in length but averaging only 30–80 meters (100-265 feet) in width. Regenerative design strategies used to transform the site into a living system that offer comprehensive ecological services included: food production, flood, water treatment, and habitat creation combined in an educational and aesthetic form. 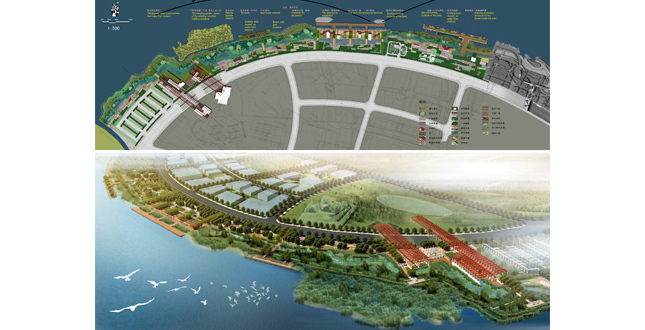 The site is destined to be an innovative demonstration of the ecological culture for the 2010 Expo. 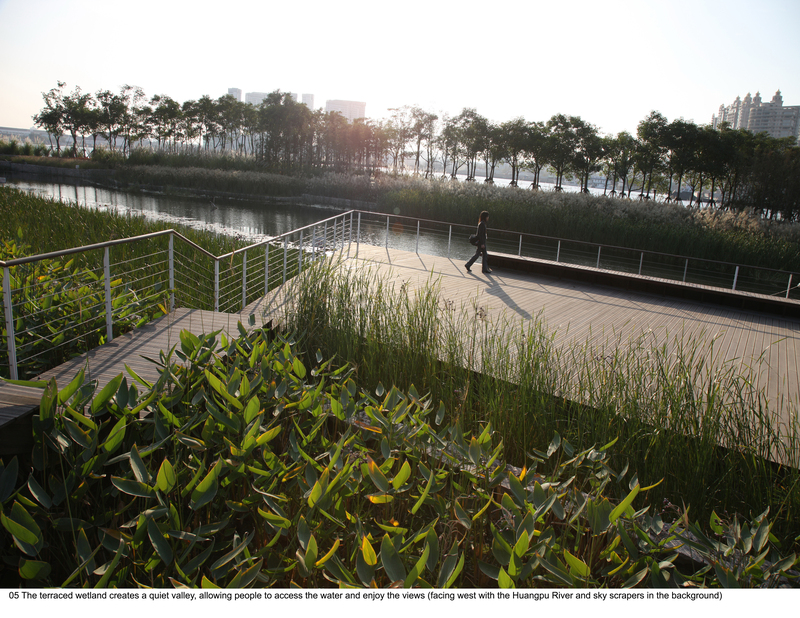 Through the center of the park, a linear constructed wetland, 1.7 kilometers (one mile) long and 5–30 meters (16.5–100 feet) wide was designed to create a reinvigorated waterfront as a living machine to treat contaminated water from the Huangpu River. 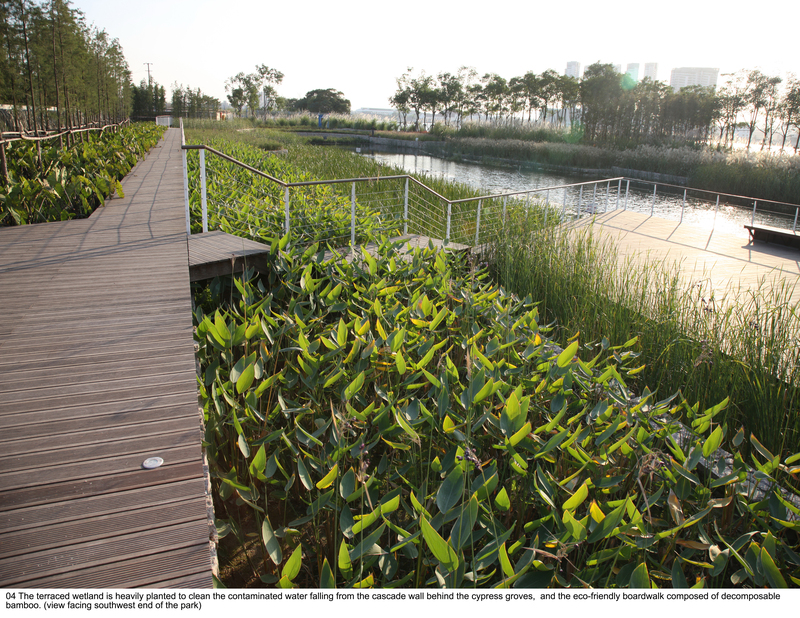 Cascades and terraces are used to oxygenate the nutrient rich water, remove and retain nutrients and reduce suspended sediments while creating pleasant water features; Different species of wetland plants were selected and designed to absorb different pollutants from the water. Field testing indicates that 2,400 cubic meters (500,000 gallons) per day of water can be treated from Lower Grade V to Grade III. The treated water can be used safely throughout the Expo for nonpotable uses, and save half a million US dollars in comparison with conventional water treatment. The wetland also acts as a flood protection buffer between the 20- and 1000-year flood control levees. 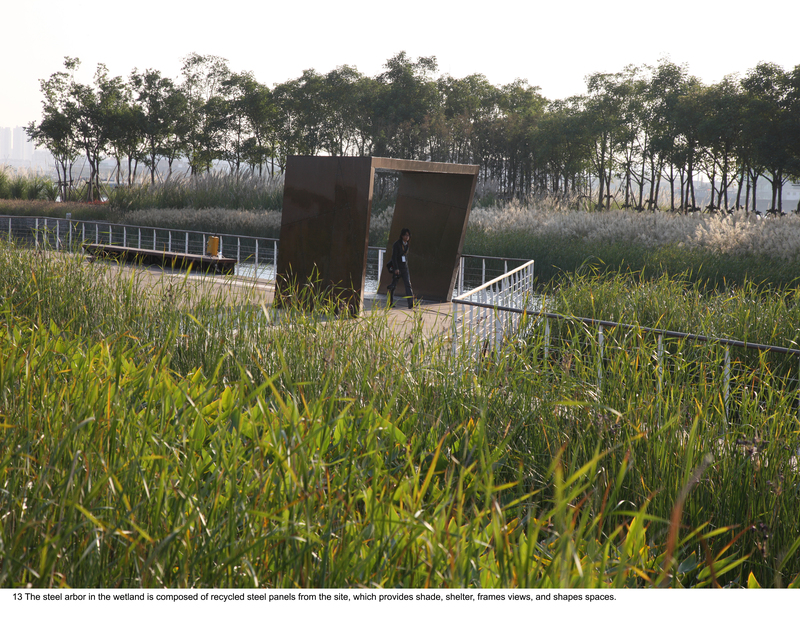 The meandering valley along the wetland creates a series of thresholds creating visual interest and refuge within the bustling world exposition with opportunities for recreation, education, and research. 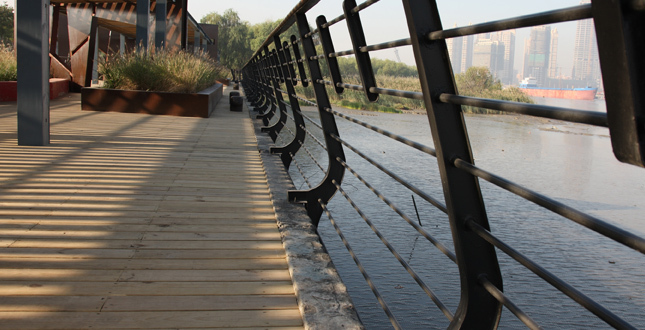 The terrace design of the wetland alleviates the elevation difference between the city and the river, safely reconnecting people to the water's edge. Additionally, the existing concrete floodwall was replaced by a more habitat-friendly riprap that allows native species to grow along the riverbank while protecting the shoreline from erosion. Overlapped in the matrix of ecologically regenerated landscape are layers of agricultural and industrial past of the site and the future of the postindustrial ecocivilization. 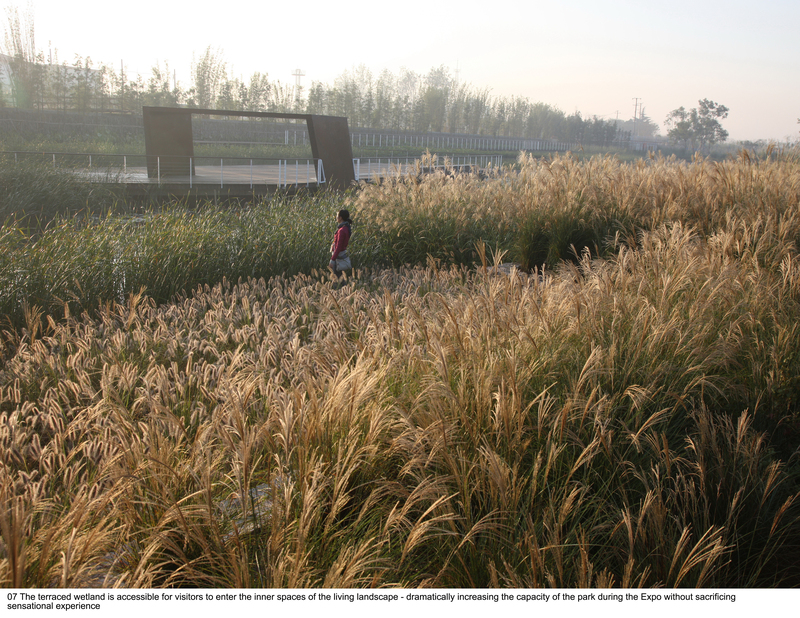 Inspired by the fields of Chinese agricultural landscape, terraces were created to break down the 3–5 meter (15–18 foot) elevation change from the water's edge to the road, and to slow the runoff directed to the stream in the constructed wetland. These terraces are reminiscent of Shanghai's agricultural heritage prior to industrial development of the neighborhood in the mid 20th century. 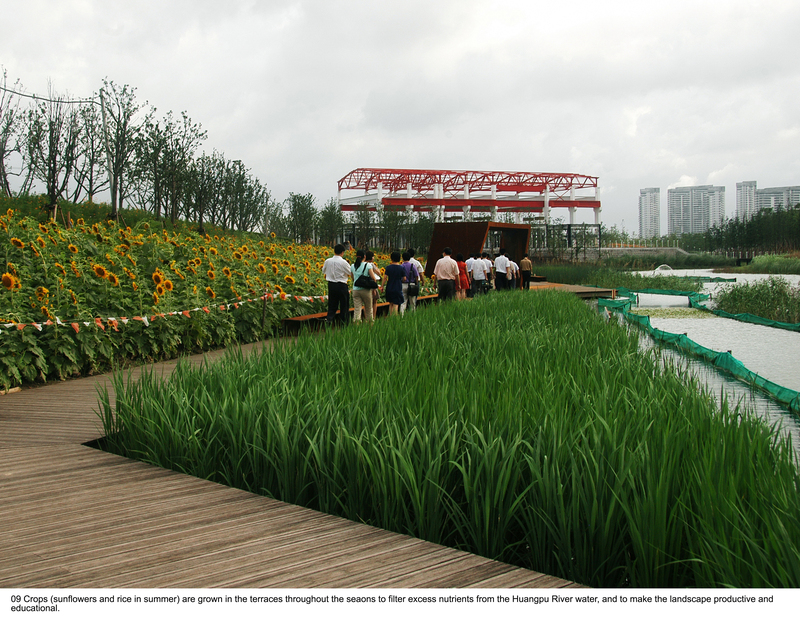 Crops and wetland plants were selected to create an urban farm allowing people to witness seasonal changes: the golden blossoms in the spring, splendid sunflowers in the summer, the fragrance of the ripened rice in the fall, and green clover in the winter. It provides a premier educational opportunity for people to learn about agriculture and farming within the city. 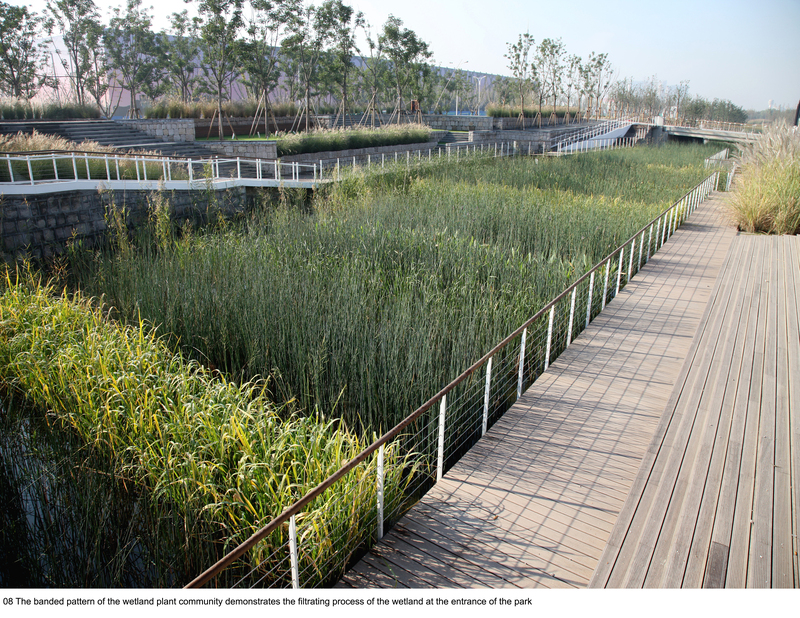 The terraces enrich the landscape along the wetland by creating spaces that encourage visitors to enter the living system through the field's corridors and experience the agricultural landscape and wetland firsthand. The paths, like capillaries of a sponge, absorb and pull people to circulate through the park. 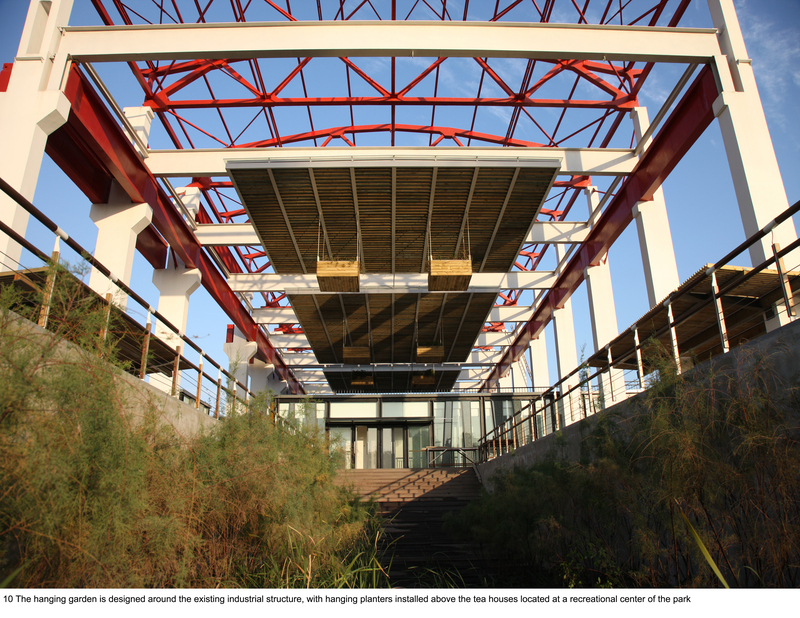 The industrial spirit of the site is celebrated through the reclamation of industrial structures and materials. Shanghai is the birthplace of China's modern industry and the iconic structures that remained onsite have been transformed into hanging gardens and overlook platforms. The reclaimed steel panels hail the site's former industrial spirit. 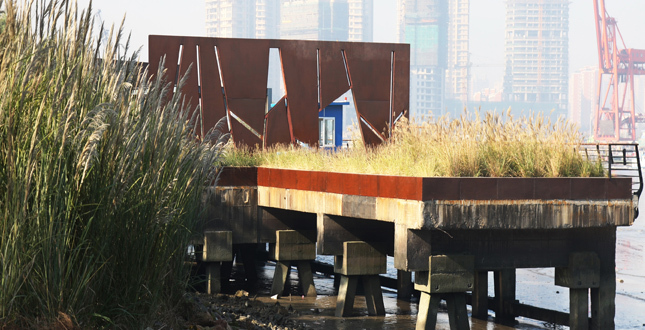 Situated throughout the wetland valley, the folded steel panels are used to frame views of Shanghai's skyline and highlight the industrial past. 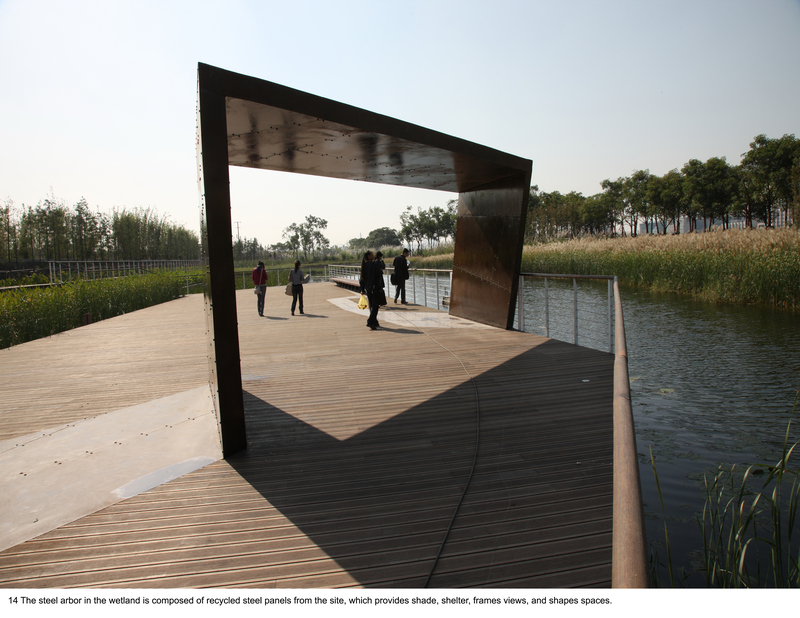 The materials are reconfigured to create artful forms, new paving material for the boardwalk, and shelters. An ecologically recovered landscape, urban agriculture and industrial spirit are the three major layers of the park, woven together through a network of paths where visitors are educated about green infrastructure within a lushly restored recreational area. 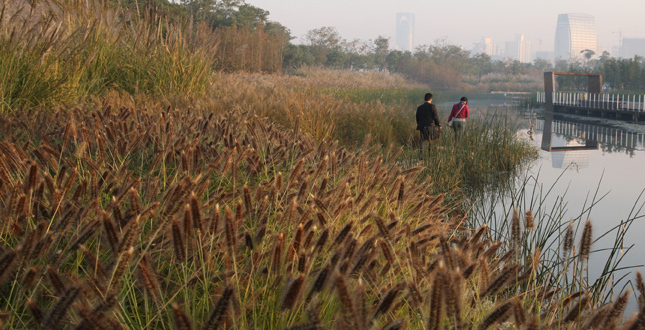 The pedestrian network is composed of a main loop, a series of perpendicular roads bisecting the wetland and a multitude of footpaths leading through the terraces. 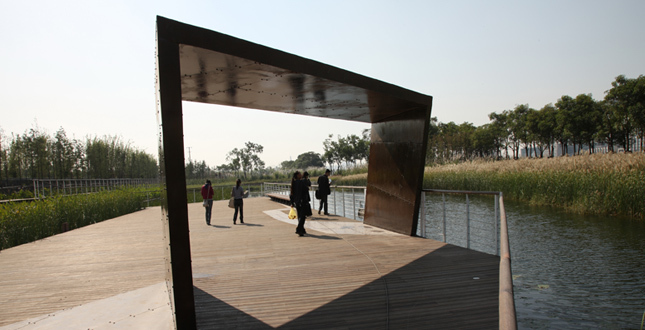 This network ensures seamless connections between the park and its surroundings, encourages access within the site that not only effectively accommodates the massive pedestrian flows expected during the Expo, but ensures a pleasant and accessible public park at the human scale afterwards. Numerous platforms and enclosed 'containers' are designed as the nodes on the pedestrian network, including the 'hanging garden' transformed from a factory structure and the landscaped dock. These platforms and containers are integrated into the pedestrian network to create larger expanses where small groups can gather. Groves of bamboo and Chinese Redwood trees act as screens along the paths to break up the spaces and the enclosures surrounded by trees are used to exhibit modern art and industrial relics found onsite. 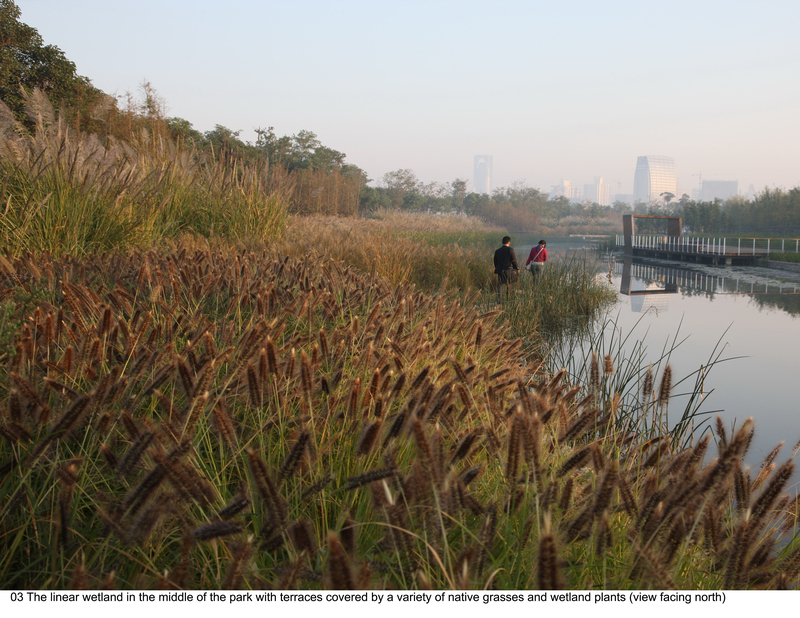 Houtan Park demonstrates a living system where ecological infrastructure can provide multiple services for society and nature and new ecological water treatment and flood control methods. The postindustrial design demonstrates a unique productive landscape evoking the memories of the past and the future of the ecological civilization, paying homage to a new aesthetics based on low maintenance and high performance landscapes.